The retro design and pull on close-fitting highlight female’s body line. 2.We think you’ll agree that this figure-hugging dress is a real head-turner. With the off-shoulder design and two pockets. 3.You’ll be head over heels all over again. Elevate the look with our heels! 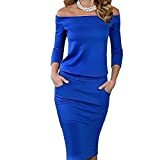 This entry was posted in Wedding Store and tagged Blue, Bodycon, Dress, Evening, Mini, Party, Pencil, pocket, Shoulder, Sleeve, Womens by Formal Affair. Bookmark the permalink.